employees, partners and clients are aware of the global best practices pertaining to safety, health, environment and quality. 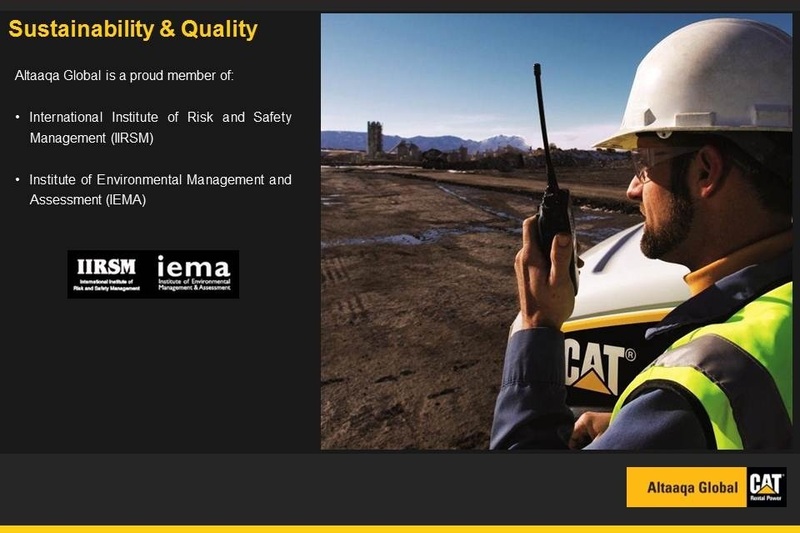 Because of our strong affiliation with Caterpillar Inc., we can assure our clients that they will get the same quality and standards as practiced by Caterpillar Inc. We are certified by the Institute of Environmental Management & Assessment (IEMA), and International Institute of Risk and Safety Management (IIRSM) among others. with employees who are untiring in their pursuit to help the world to become a better place. Making sure our advocacies are in place and reach those who are in need. We do this by helping communities through sponsoring medical missions, building schools, promoting arts and support sporting activities in the areas where we operate. In every temporary plant we deliver, we ensure that local communities and its environs benefit from our social activities and programs. Our employees work closely with community leaders, non-government organizations and local government to bring aid to those who need it the most.